We’d love your help. 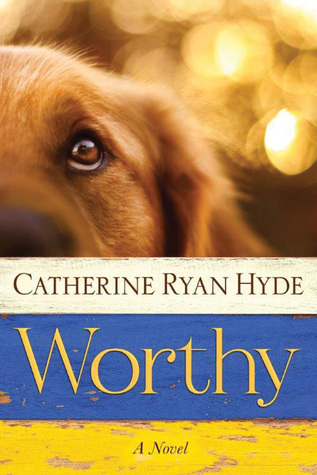 Let us know what’s wrong with this preview of Worthy by Catherine Ryan Hyde. Nineteen years later, Virginia is They might’ve been a family. To ask other readers questions about Worthy, please sign up. Tricia I was going to ask the same question - Thanks! A sweet story, but not enough dog. The audio was disconcerting as well. There were two readers, one male, one female. When a chapter was about a male, Buddy, for instance, the male would try to mimic a female voice when necessary. I kept thinking, you have a female narrator. Why isn't she speaking for the female in this chapter. I absolutely LOVED this book. It was such a heart breaking and heart warming story. It made me cry real tears and also smile. I adored the wonderful and very real feeling characters, including the dogs. With listening to it as an audiobook, the characters really came to life and kept me company while I was home alone over the weekend. I actually felt quite sad when this book finished, as I really missed the characters that had been with me for a couple of days. I can’t wait to read or listen to I absolutely LOVED this book. It was such a heart breaking and heart warming story. It made me cry real tears and also smile. I adored the wonderful and very real feeling characters, including the dogs. I can’t wait to read or listen to more by this author, as this is my favourite audiobook so far, and if her other stories are only half as wonderful and touching as this one, I’m sure I’m going to love them too. I would like to thank Netgalley and Lake Union Publishing for an ARC of this book! I have read some many of Catherine Ryan Hyde's books and there are so many I love as favorites, this is a new one. She can write such heartfelt books. Aaron and his 4 year old son Buddy and their dog Sheila walk every day to the diner just so Aaron can spend time with Virginia (Ginnie). They eat as well of course :) Aaron and Ginnie have feelings for each other and he finally gets up the nerve to kiss her and ask I would like to thank Netgalley and Lake Union Publishing for an ARC of this book! Aaron and his 4 year old son Buddy and their dog Sheila walk every day to the diner just so Aaron can spend time with Virginia (Ginnie). They eat as well of course :) Aaron and Ginnie have feelings for each other and he finally gets up the nerve to kiss her and ask her out on a date. Unfortunately, a tragedy strikes on their walk back home and Buddy ends up getting carted away to live with his grandparents in Florida. Nineteen years later, Ginnie and Fern own the diner where they worked all of those years ago. The diner was put up for sell that same fateful day that Aaron and Buddy came in to eat. Buddy suggested she buy the diner so she wouldn't have to move or worry about another job, and her and Fern did just that. Ginnie is engaged to a jerk named Lloyd. Fern can't understand why and Ginnie has been having some reservations. But all of this changes when Lloyd tries to get rid of Ginnie's dog T-Rex that she has had for 6 years and loves more than anything. Needless to say, when she finds out, Lloyd is out the door and she meets a boy named Jody that took in her dog and saved him from freezing to death. From here is a story of old wounds, healing, love, and the ability to change lives forever in a most wonderful way! Twenty years earlier, Virginia had met the man she planned on spending her life with. Then tragedy struck and not only did she lose the love of her life but she also lost any chance at being a part of his young son's life. When her dog goes missing it is that same boy, now in his early twenties who rescues him. He still suffers from the accident that took his father. He is terrified of his own shadow. But together with a dog they somehow take the first steps at rebuilding their lives. Loved this Twenty years earlier, Virginia had met the man she planned on spending her life with. Then tragedy struck and not only did she lose the love of her life but she also lost any chance at being a part of his young son's life. What a heart warming, heart breaking, true to life, sensitive story this is. Its written the way only Catherine Ryan Hyde can. She brings it all out to the fore. I just am such a fan of her work and read almost all of her books now. Each day Aaron and his son who is only 4 years old walk to the diner to spend some time with Ginnie. Aaron has had a soft spot for Ginnie since...oh...forever, and finally he brazens it out and kisses her and asks her on a date. But wow, on the way home walking back a tragedy happens. Really heart rending, this results in his young son Buddy being taken to live with his Grandparents. Ginnie is heartbroken and grieving. There are further developments 19 years later that bring them together. Ginnie comes across to me a very sensitive woman, strong, but also worthy of knowing she can be strong when she needs to be. Buddy is just a diamond. I loved how he was portrayed. And the dog that binds them altogether? Read it and see. I dare you to read it and not 'feel' something. I dare you to not shed a tear. Its sad, there is no getting away from this and definitely you will need tissues. books for that reason. The author and I are off to a good start with this one. Second chances are the focus here for a boy named Buddy, a woman named Virginia and a dog named Worthy.The story is heart-breaking and uplifting. I ran the gamut of emotion as I found myself invested in these characters. And the double meaning of the book's title hit home. Yep, she and I are off to a great start. One quiet, sensitive young man called Jody, sadly bereaved and now left all on his own, all his family gone, except for an abandoned dog that he’s recently adopted after he’d come upon the scene of the friendly dog being dumped in a forest in the freezing, icy snow and winds. That dog would have been a gonner if he’d not taken him in. Now they are truly bonded, ready for their new lives together. One lady, Virginia, newly engaged to be married in her later years, but searching fruitlessly for her One quiet, sensitive young man called Jody, sadly bereaved and now left all on his own, all his family gone, except for an abandoned dog that he’s recently adopted after he’d come upon the scene of the friendly dog being dumped in a forest in the freezing, icy snow and winds. That dog would have been a gonner if he’d not taken him in. Now they are truly bonded, ready for their new lives together. One lady, Virginia, newly engaged to be married in her later years, but searching fruitlessly for her missing six year old dog T Rex, who has mysteriously disappeared from home while she was at work in her diner. She has done all she can to find her faithful friend, posting flyers with photo I.D. and her contact details. Sadly the dog seems to have vanished into thin air. One dog, missing his old mistress but now living in a kind new home and named ‘Worthy’, glad of the warmth and having been rescued, no longer hungry, cold and abused by the man in the red truck who left him behind, the man who hated him. This is the story of these people, Virginia and Jody, and the dog called Worthy. Nineteen years ago they briefly met each other although neither knows it, but then tragedy wrenched them apart. They have more in common than the love of a dog, but will they ever discover the truth of what happened? Catherine Ryan Hyde excels in storytelling and rich characterisation, but no time better than when she is writing about something she is passionate about and holds dear in her heart: in this novel, a dog. This story is rich in emotion, with issues of betrayal, loss and friendship at its very heart. Both Jody and Virginia are wonderful characters, good to the very bone. Both have lived through tragedy of the cruellest kind and have been damaged by it. When they meet at Jody’s lodge in the forest by the lake they both have a chance at enduring happiness if only they make the right choice. But the right choice is such a difficult option for both of them. I loved everything about this novel full of tender empathy and warmth. Although marketed as Adult Fiction I truly believe that Young Adult readers would very warmly receive and enjoy this novel as well. I would like to thank Netgalley and Lake Union Publishing for my copy of ‘Worthy’ in return for an honest review. I am a great fan of Catherine’s novels, I’ve read and enjoyed every one. This one is just as lovely as all of the others. A special thank you to Lake Union Publishing and NetGalley for an ARC in exchange for an honest review. Nice cover. 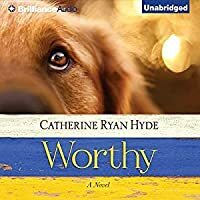 Catherine Ryan Hyde’s WORTHY is a lighthearted, simple yet painful story of a sensitive mentally challenged little boy, and a lonely adult woman, both connected by their love of one lovable dog--a past, a loss, a tragedy, and memories which forever changes the course of their lives. Aaron is a raising a four year old son, Buddy with fears of everything. He has phobias, and does no A special thank you to Lake Union Publishing and NetGalley for an ARC in exchange for an honest review. Nice cover. Aaron is a raising a four year old son, Buddy with fears of everything. He has phobias, and does not interact well on a social level. He loves his dog named Shelia and does not do well with bridges. Virginia works at a nearby diner and has fallen for Aaron, and his little boy. She has her heart set on future dates with this man, a life, and can see herself being a stepmom to little Buddy. One night when leaving the diner, a tragedy occurs and the sweet family Virginia had planned comes to an end, as quickly as it began. When she tries reaching out to the boy, his grandparents have come to take him away and she has no way to find him. The grandparents are not very caring people and everything Buddy has known is gone. Heartbroken, Virginia gets on with her life, buys the diner with her friend, Fern and later at age fifty-seven settles for a loser guy and is engaged to marry. This guy is jealous of her dog, and takes the dog off to the woods to get rid of him while she is at work. Of course she is frantic and searches everywhere for her dog. In the meantime, Aaron moves to Florida with his grandparents and they still have the cabin in the same town where the tragedy occurred. Aaron has had a rough childhood and now finds himself taking care of his elderly grandfather with dementia. Aaron is mentally challenged even at age twenty, with the mind of a child. Now he is left in a grownup world with big responsibilities when some mean man lets a dog off, in front of his house in the cold of winter to die. He will rescue this dog and make it his own. He will name it Worthy and no one will take it away from him. However, fate steps in and Virginia and Aaron connect again. With the shared love a one dog, may be just what the doctor ordered, for both these lost souls. An avid fan of Catherine Ryan Hyde for years, and a lover of Golden Retrievers (this dog was a mix); however, felt WORTHY was lacking in substance, and seemed a little juvenile and disconnected, more like a children’s book, than an adult fiction. May appeal to some readers; however, I need a little something more to stimulate my literary cravings with depth; a little too elementary, for my taste. I would recommend TAKE ME WITH YOU, landing on my Top Books of 2014. I really enjoyed this book. I had a good idea how the basic story was going to unfold, but I was unprepared for the way this author had with subtle nuances and it is those which gave this book its emotional depth. Virginia meets Aaron, who is a widower and a dad of a small boy. Something happens, right after their first kiss, and Virginia's heart is broken. Fast forward 19 years and bit by bit, the past is explained. I won't say anything more, but suffice to say that the story was beautifully told I really enjoyed this book. I had a good idea how the basic story was going to unfold, but I was unprepared for the way this author had with subtle nuances and it is those which gave this book its emotional depth. During a vacation to Mexico, while lounging on the beach, a woman in a chair close to us got up and walked toward the ocean for a swim; her husband, sitting on the other side of her, was now visible to us and had a book in his hand, close to his face. I realized that he appeared to be crying and discreetly pointed out this fact to my husband; he said, "Wow. I wonder what's he's reading?" Shortly after, we discovered that he was reading Marley & Me. Later, the gentleman passed us by, shaking During a vacation to Mexico, while lounging on the beach, a woman in a chair close to us got up and walked toward the ocean for a swim; her husband, sitting on the other side of her, was now visible to us and had a book in his hand, close to his face. I realized that he appeared to be crying and discreetly pointed out this fact to my husband; he said, "Wow. I wonder what's he's reading?" Shortly after, we discovered that he was reading Marley & Me. Later, the gentleman passed us by, shaking his head, as he glanced toward my husband; my husband stood and said, "Hey, it's okay, man; I cried like a baby." I'm a sucker for a good story that involves a great dog. Worthy is about a dog, the people he connects, and the power of redemption which, as the author so deftly demonstrates, manifests itself in many different ways. It's also about discovering whether we, as individuals, are worthy and who we should allow to determine our worth; do we feel worthy because of the circumstances we've endured in life or because others validate our worthiness? This review has been hidden because it contains spoilers. To view it, click here. The stories created by Catherine Ryan Hyde have always had a great pull on me. I enjoy the ordinary people she portrays. Ordinary people with a story to tell. Worthy is a story that’s both sweet and sad. It’s about a possible connection between a man, a woman, a child and dog – a connection that never happened. A possible loving relationship that didn’t receive the opportunity to bloom because the man and the dog drowned, the 4-year old boy is whisked away to Florida by his maternal grandparents The stories created by Catherine Ryan Hyde have always had a great pull on me. I enjoy the ordinary people she portrays. Ordinary people with a story to tell. Worthy is a story that’s both sweet and sad. It’s about a possible connection between a man, a woman, a child and dog – a connection that never happened. A possible loving relationship that didn’t receive the opportunity to bloom because the man and the dog drowned, the 4-year old boy is whisked away to Florida by his maternal grandparents, and the woman is left mourning. For 19 years. Until extraordinary circumstances and another dog reunite the now grown boy and the woman again. I felt rather melancholic reading this book. But let me tell you that young man, Jody (a.k.a. Buddy) is extraordinary. He’s not like anyone else. He’s somewhat socially inept and must suffer some sort of disorder, but he’s greatly unique. His heart is so pure. I also liked the deputy sheriff, Rondelle, such a capable and sensitive man. This story will lift your spirits and leave you believing in the goodness of some people. Catherine Ryan Hyde has a gift of writing beautiful characters. I have not yet finished one of her novels without feeling a great drive to make myself a better person. Longtime readers of my blog are well aware of my love affair with the writing of Catherine Ryan Hyde. She writes incredibly believable, flawed, beautiful characters and has a way of making a 'simple' story(i.e. no giant plot twists, explosions, etc.) beautifully nuanced and softly entrancing, so that the reader falls into the story Catherine Ryan Hyde has a gift of writing beautiful characters. I have not yet finished one of her novels without feeling a great drive to make myself a better person. Longtime readers of my blog are well aware of my love affair with the writing of Catherine Ryan Hyde. She writes incredibly believable, flawed, beautiful characters and has a way of making a 'simple' story(i.e. no giant plot twists, explosions, etc.) beautifully nuanced and softly entrancing, so that the reader falls into the story and comes out the other side a changed person. This novel is no exception. I can't really express how much I love this book. Now overall, I am pretty sure I tend to rate books with dogs in them rather high, since I am such a dog lover, but realizing that, I am trying to more closely analyze those types of books before jumping into a review. Taking that into account, I still have to give Worthy 5 stars. I have not previously read any of Hyde's works, and was drawn into this one when I saw it on Netgalley strictly by the cover. However, it proved to be a good leap of fai I can't really express how much I love this book. Now overall, I am pretty sure I tend to rate books with dogs in them rather high, since I am such a dog lover, but realizing that, I am trying to more closely analyze those types of books before jumping into a review. Taking that into account, I still have to give Worthy 5 stars. I have not previously read any of Hyde's works, and was drawn into this one when I saw it on Netgalley strictly by the cover. However, it proved to be a good leap of faith. Worthy is a book about finding one's self worth. It isn't necessarily a love story, but love stories do play an important role in the book. Virginia dumps her fiance after he dumps her beloved dog out a country road on the coldest night of the year while she is at work. A young man, Jody, takes the dog in and takes on the role of the dog's savior, vowing to never return such a "worthy" animal to such a loser. Jody has had a tough life and has socialization issues, but Worthy manages to bring him out of his shell and reunites him with a part of his past which he doesn't realize he desperately needs. I love almost everything about this book. I immediately felt a connection with Virginia and Jody. I truly enjoyed Virginia's relationship with her best friend Fern, who has no trouble telling Virginia how things really are in life. She also shows up with much needed martinis when they are needed. The story is sad in places and definitely tugs at your heart. However, the sadness wasn't overdone and even in the dark areas, you could tell there was always a glimmer of hope. Finally, this book takes place in a small-town and for some reason, even though I grew up in a small town and hated it as a child, I love the dynamics of small towns in many books I read. Virginia and Jody both have losses in their life. A wonderful but at times a little sad story of the dog that brought these two together in their time of need. another charming heartwarming tale by this author. I have not been disappointed yet by any of her books. thank you netgalley for this s advance copy of this book. loved it! I knew where the plot was heading, but kept reading to know for sure that all the characters were hoping to be OK. It's that kind of book - as the reader you care what happens to the people. The length of this book does not allow for character development; however, they are believable and consistent. Very sweet story. Wish there was more to the 'reveal'. The ending dragged for me, a little too Hallmark-y. Another great book from Catherine Ryan Hyde. I mean look at that book cover. How could it NOT be awesome? Hyde's trademarks are books filled with heart, poignancy, and genuine compassion. This one is no different--keep a box of tissues handy. From the author of 'Pay it Forward', a moving tale, though it does rely heavily on coincidence for the story to work and the elements to fit together. Nearly twenty years ago, a young boy named Buddy undergoes a traumatic night severing his family apart, and he leaves the small town he knows as home. Now Virginia, a waitress who knew Buddy as a boy is about to marry someone in that town, and her beloved dog goes missing in the depths of winter... A young man finds him and wrestles with his conscience about returning him. Both are struggling with issues, the dog may just be the means of reuniting them, their story started so many years ago might have a chance at resolution. It's sentimental, but quite a moving story, though it is hard to accept the big leaps in plausibility at times. I didn't quite understand what Buddy's issues were, preferring Virginia as a character. This review has been hidden because it contains spoilers. To view it, click here. Not my fav from this author, but an OK read. Did think For a ‘dog’ book, really had little to do with the dog. A tense, tragic scene begins on page 37, builds in noise and intensity, not letting up until page 43. I’m pretty sure I held my breath during all six pages and when it was over, I felt as if I’d returned to the pages of Cold Sassy Tree, a novel by Olive Ann Burns that I loved and read almost twenty years ago. This second inciting incident (I’m counting the first inciting incident as Virginia meeting Aaron and Buddy) changes the fate of the characters for the rest of the story and it was my dogged A tense, tragic scene begins on page 37, builds in noise and intensity, not letting up until page 43. I’m pretty sure I held my breath during all six pages and when it was over, I felt as if I’d returned to the pages of Cold Sassy Tree, a novel by Olive Ann Burns that I loved and read almost twenty years ago. This second inciting incident (I’m counting the first inciting incident as Virginia meeting Aaron and Buddy) changes the fate of the characters for the rest of the story and it was my dogged determination to figure out what happened to everyone that kept me reading. That, and the charm of the golden retriever/German shepherd mix at the center of the story named Worthy. Worthy is the thread woven throughout the fabric of the novel but the story belongs to a woman named Virginia and a young man named Jody. Alternating chapters tell their stories as a shared past is revealed and the two deal with new information. I enjoyed this quiet novel. Enjoyed the moments when Worthy was on the page, enjoyed the subtle, unfolding resolutions that made this a satisfying read. It was a smooth, easy read with great balance in the chapters – balance in setting, balance in dialogue, balance in plot and character development; the kind of read that comes from reading an accomplished writer with twenty-seven novels under her name thus far. Catherine Ryan Hyde can sure craft a scene, a chapter, a novel. Smooth writing, smooth reading. Perfect for a summer afternoon in my backyard while my own new puppy ran about in the grass. My first BookSparks Summer Reading Challenge book. And I loved it! It's no secret, I love books about lonely people finding each other. But I have never met a character I can relate to more than Jody. He is a very shy and quiet young man who gets fairly freaked out by people. Virginia is a waitress about to settle for a real jerk. Said jerk dumps her dog off by the lake because he can't handle the competition. Jody saves the dog and changes his name from T.Rex to Worthy. He knew someone was looki My first BookSparks Summer Reading Challenge book. And I loved it! It's no secret, I love books about lonely people finding each other. But I have never met a character I can relate to more than Jody. He is a very shy and quiet young man who gets fairly freaked out by people. Virginia is a waitress about to settle for a real jerk. Said jerk dumps her dog off by the lake because he can't handle the competition. Jody saves the dog and changes his name from T.Rex to Worthy. He knew someone was looking for the dog, but he thought it was the bad guy who dumped Worthy. Jody and Virginia work out the dog situation...as they both love him and there's no clear legal precedent. Jody clearly needs him more than she does...but Jody does the decent thing and brings Worthy back to her, asking only that she let him keep his name. They get thrown together and spend a lot of one on one time talking and figuring things out. She thought she was going to marry his dad before his dad died. Poor Jody lost his mother when he was a toddler, his father when he was 4, his grandmother some years later and finally his last family member...his grandfather dies early in this story. He has no one, and he's lost everything. Jody is jumpy, afraid of disappointing people, and prefers to be alone. But even so, he feels a crushing loneliness. Virginia might just help with that, if he'll let her. Diner waitress Virginia is thrilled when widower Aaron finally asks her on a date. She has been dreaming of the moment, and has already imagined herself becoming a part of his and his young son Buddy's lives. When tragedy strikes that very night, young Buddy is taken away to live with his grandparents, and Virginia is left to grieve a relationship that never really started. Nineteen years later and Virginia is engaged, but she has never forgotten Aaron or Buddy. When her dog disappears and is fou Diner waitress Virginia is thrilled when widower Aaron finally asks her on a date. She has been dreaming of the moment, and has already imagined herself becoming a part of his and his young son Buddy's lives. When tragedy strikes that very night, young Buddy is taken away to live with his grandparents, and Virginia is left to grieve a relationship that never really started. Nineteen years later and Virginia is engaged, but she has never forgotten Aaron or Buddy. When her dog disappears and is found and taken in by a shy young man who bonds with the animal and is reluctant to give it back, dialogue between them reveals a connection from their pasts that will change both their lives. Ryan Hyde has succeeded again with 'Worthy' in creating a beautiful and endearing story with amazing characters. Buddy was just captivating and Virginia, strong, independent, but fragile at the same time just touched my heart. Add in T-Rex, the lovable dog set to bind everyone together and...wow, just a wonderful read. As with all of Ryan Hyde's books, the supporting characters are just as deserving of a place in the story. I really admired Fern, the staunch best friend and the rather wise Deputy Rodelle here. If you're looking for a heartwarming tale, rich in detail and characterisation then pick up this book and enjoy! *Thank you to the publishers for providing a review copy through NetGalley. I've read many of author Hyde's books, including the wonderful PAY IT FORWARD. She has a real talent for getting the reader's attention from the first page and keeping it until the very last words of the story. In WORTHY, waitress Virginia is well on her way to falling in love with Aaron, a widower with four year old son Buddy. And on the day that she is asked for her first date with Aaron, a horrific accident happens. Fast forward nineteen years and it's amazing how fate works (or the hand of God if you prefer). An old acquaintance is brought back into Virginia's life and life is looking up for everyone. Great character development - I felt like I actually knew the main characters of this special story. Heartwarming with exciting twists and turns, I heartily recommend this story to Hyde fans and fans of women's fiction. Jody’s life is turned upside down. He is a little challenged socially and lives off of his grandfather’s social security. He witnesses an act of animal cruelty and takes on a wonderful dog. Virginia is linked to Jody and when things with Jody’s grandfather don’t go so well she realizes she knows Jody from many years before. She can potentially make his life really easy. Way too easy for real life I think. But hey it lightens up the book. It is about a good dog bringing two people together. I'm an avid hiker, traveler, equestrian, and amateur photographer, and have released my fir I am the author of more than 30 published and forthcoming books, including ALLIE AND BEA, SAY GOODBYE FOR NOW, LEAVING BLYTHE RIVER, ASK HIM WHY, WORTHY, THE LANGUAGE OF HOOFBEATS, TAKE ME WITH YOU, WHERE WE BELONG, WHEN I FOUND YOU, WALK ME HOME, SECOND HAND HEART, DON'T LET ME GO, and WHEN YOU WERE OLDER.